Sure, the information revolution has dramatically raised the prospects for global development by connecting businesses from Singapore City to Swartz Creek, Michigan -- but what has it done for you lately? Later this month, Diet Coke will harness the power of a staggeringly cutting-edge multimedia platform, solely to provide you with exclusive access to the stylish celebrities you crave. At the end of January, Diet Coke's using the most super-futuristic means at its disposal to blast out TBA performances the equal of its seminal December 9th event, which showcased Pharrell-endorsed R&Ber Robin Thicke and fashion maven Cynthia Rowley (catch the Dec. 9 show right here). For starters: the performances, recorded in the Reuters studios, will be broadcast live over the bookend Reuters & NASDAQ billboards; for crystal-clear audio, just call the number projected on the screens, thereby blowing your mind with the contrast between thousands of square feet of state-of-the-art signage, and the tiny device you use to receive steamy, $1.99 texts from "beautiful and interesting area singles". 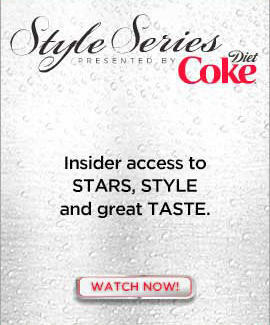 If you can't catch the live show, everything's being streamed live at DietCoke.com/StyleSeries -- so you can watch from anywhere, provided you've finally upgraded your operating system from "Commodore 64". Check back at the site weekly, and you'll also be privy to multiple segments featuring more footage and interviews with your favorite celebrities -- because as the means for conducting business become infinitely more rich and varied, so too must the means for avoiding conducting any business at all. Catch the action in Times Square –- they'll be handing out tons of free Diet Coke, a far better excuse to leave the office than "Hot Nuts". If you can't make Times Square -- because you don't work there, or are agoraphobic -- check it out live on Dietcoke.com/styleseries.